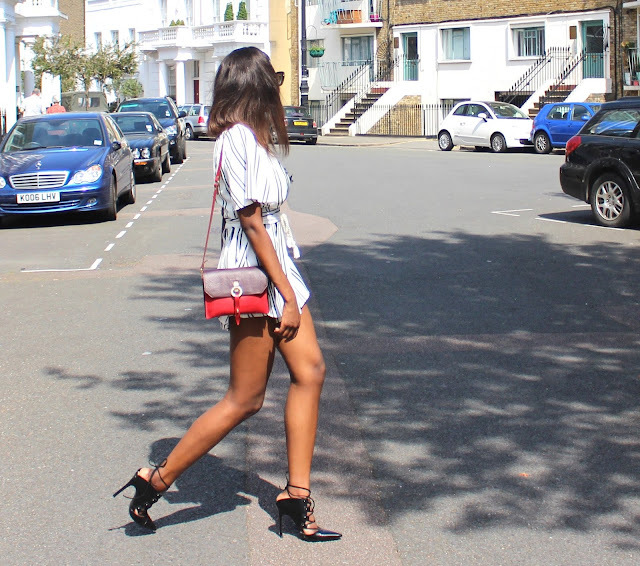 One of my favourite go to styles for Summer is the playsuit and this little number, courtesy of Romwe.com is my latest addition to my playsuit collection. The deep plunge playsuit fro Romwe is pretty lightweight which is great for summer. one of the main contributing factors to me selecting it was based the deep plunge detail which I happen to love. Although I will say beware to all those with bigger cup sizes, The playsuit ay not hold your babies in place as I didn't quite feel secure in mine and so I opted to wear a lace top underneath to avoid any dress malfunction of sorts. There is a lot that I love about wearing a playsuit. With one of those being, the benefit of wearing a short piece whilst also having the freedom to move about without having to worry about exposing your undies. Especially if there were a hug gust of wind blowing in your direction. This is an issue that is always at the back of my mind whenever I wear short piece but not so much when wearing a playsuit. What are your thoughts on this playsuit?